Last week I wrote about Ann Patchett, a bestselling author who opened a bookstore after experiencing life in a city without one (http://wp.me/pYql4-1Kn). A few days later, on a drive into the gold country, Mary and I were reminded of what a treasure a community bookstore can be. The Book Seller has been a fixture in Grass Valley, CA since 1977. For whatever reason, we hadn’t stopped by since the days when every small town had a bookshop. In the days before anyone said, “brick and mortar,” because there was nothing else. We didn’t set out with this or any other destination in mind, but stopped to look in the window and then walked in. Several customers chatting with the salesclerk and carefully arranged displays in the front suggested the store was thriving. With Ann Patchett’s words in my mind and Joni Mitchell’s too – “You don’t know what you’ve got till it’s gone” – I looked around to see what made this bookstore work. Unique books for one thing, stacked from floor to ceiling. I leafed through a few biographies I hadn’t seen before. The selections had clearly been made by readers, not corporate marketing groups. Lots of books of regional interest – fiction, history, natural history, and travel guides for the gold country and the Sierra foothills were well represented. And ebook fans were not left out. Notes on every shelf invited readers to order Google format books from the Book Seller’s website. You can read these ebooks on pcs, macs, smartphones, tablets including the kindle fire, and all dedicated readers except the kindle. Kit Hattem, owner of the Book Seller since 1985, said the store functions as a hub of a vibrant local writing community. 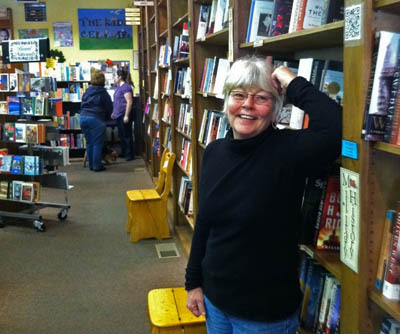 As if to emphasize her words, Steve Sanfield, a nationally known poet, author, and storyteller strolled in to chat with the sales clerk and browse for a few minutes. Sanfield founded a popular summer event, the Sierra Storytelling Festival, 26 years ago. I think you’ll enjoy The Book Seller’s website, http://www.thebookseller.biz/. If you read ebooks, think about ordering your next one from them. And look around your own area. What gems like this are waiting to be discovered and win your support? This entry was posted in Books, Culture and tagged books, Community, Culture, ebooks. Bookmark the permalink. Good bookstores are such a treasure. When I visited San Francisco for the first time, I happened upon a local bookstore that stocked McSweeney’s and nearly cried because it felt so beautiful. I agree, bookstores like that are a treasure. I guess the closing of Borders made me realize that bookstores may be an endangered species. Ironic perhaps, since Borders pushed it’s share of indies out of business, but rather than spend time in blame, I like to think the choices I make now can make a difference. Thanks for visiting! Thanks, Morgan. I didn’t know about this bookstore. It sounds like it would be worth a trip to Grass Valley, always a nice place to go.